The threat of recession will continue to hold back one-in-four outsourcing buyers from signing contracts until the current economic uncertainty ends. Outsourcing buyers will be cautious and buy smaller deals with simpler pricing models. 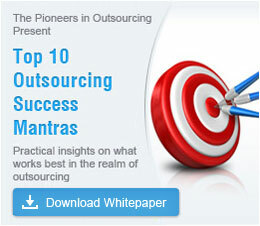 By mid-2012, there might be an increase in outsourcing activity and offshoring deals. By the end of 2012, the buzz around cloud computing will significantly die down, say outsourcing experts. Leading IT managers will look at cloud computing risks and its value more critically in 2012. Companies will not be implementing cloud computing without evaluating other alternatives. Outsourcing observers predict that companies will start creating policies on what can be a cloud, who will review cloud services, what data can a cloud service contain and who has to be involved in making cloud related decisions. Earlier offshore vendors would only concentrate on getting deals from big companies, but with very few Fortune 1000 companies left to partner with, IT outsourcing deals will get smaller. Service providers will introduce pricing models based on consumption and business outcomes that will in turn lower costs for clients and result in smaller deals, say outsourcing experts. Outsourcing experts warn vendors to concentrate more on process improvement, innovation, flexibility and better technology in 2012, as outsourcing customers will want more than a low cost vendor. 2012 will be the start of a new season where IT service buyers will look beyond low cost services. Outsourcing experts predict that you should not expect HP-EDS, Dell-Perot, Xerox-ACS type of mergers in 2012, due to shortages of second-tier service providers. However, you can expect three-way mergers between mid-size players and acquisition of western service providers by Indian firms. Outsourcing observers have predicted that 2012 will be the year of security. With businesses becoming more worried about the security of their data, outsourcing companies will look for new and better ways to protect the data of their customers. 2012 will mark the change when offshore vendors will move beyond only providing application development and maintenance. A large number of companies will be shifting their businesses to IT infrastructure providers in outsourcing countries, as opposed to U.S based IT infrastructure providers, predict outsourcing experts. Though India will continue to remain as the world's outsourcing capital and the main center for offshoring, companies will start outsourcing to other countries like Brazil, Malaysia, Mexico, South Africa, Romania and Bulgaria, say outsourcing experts. Vendors in 2012 will have to consider innovative and even risky offshore engagement models to stay competitive. Outsourcing experts predict that there will be a rise in joint ventures, innovation labs and dedicated centers of excellence. Make the most of outsourcing in 2012 by outsourcing to India, the world's preferred outsourcing destination. You can outsource almost any service to India, be it customer support, market research, transcription, data entry, photo editing or medical billing. Get in touch with us to outsource to India. Milestones and future prospects in the Indian ITES arena. Need an Indian visa for business visit? Find the nearest Indian embassy situated in your country and services it offers.